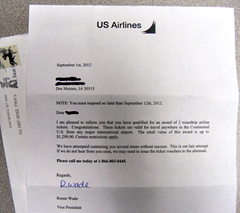 Thousands of Iowans are getting letters in the mail saying they’ve won two roundtrip airline tickets, but beware before you start packing your bags. The letters may look like a traditional form letter from something called U.S. Airlines, or they may resemble two boarding passes. Whichever one you may get, Geoff Greenwood at the Iowa Attorney General’s office, says the offer has several red flags that point to it being iffy. “People are being notified that they were ‘selected,’ that they ‘qualified’ for an award,” Greenwood says. While he’s not saying it’s a scam, Greenwood is saying to be very cautious.